Taking a look at last year’s most valuable baserunners, not a lot jumps out as being unusual. You’ve got Jacoby Ellsbury, who stole 52 bases. You’ve got Eric Young and Elvis Andrus, who each stole at least 40. You’ve got Mike Trout, who stole 33 and, like, isn’t a human. And then you’ve got Alcides Escobar, who has stolen 35 in the past and still managed to swipe 22 despite having the lowest on-base percentage in baseball. Thing is, baserunning value doesn’t come solely from successful and unsuccessful steal attempts. That is a big part of it, yes, but there is something to be said about the ability to take the extra base that a less aggressive or less aware baserunner might not take. Matt Carpenter only stole three bags last year and was more valuable on the bases than speedster Alejando De Aza, who stole 20. Take a look at this year’s early most valuable baserunners and, unsurprisingly, Dee Gordon and his eye-popping 24 steals tops the list. The name after that, though, stands out as a little unusual. When you think of Brian Dozier, you probably don’t think of a burner. You probably think more along the lines of “non-prospect middle infielder with surprising power and mediocre on-base skills.” Now, Dozier did steal 23 bases in his first season-and-a-half in the big leagues and his 12 steals already this year are tied for fourth. However, that’s half as many as Gordon and they have nearly identical baserunning values. That’s only one more steal than Andrus , and Dozier’s baserunning value is nearly double Andrus’. Dozier clearly is doing something besides stealing bases that is making him the most valuable baserunner in the American League. OK, this one’s not really out of the ordinary, but that’s why I’m getting it out of the way now. Brian Dozier does this, like, all the time. It’s one thing to go first-to-third on singles to right field. Dozier goes first-to-third on singles to center, regularly. I could have put five or six examples of this exact thing happening, but that would just be silly. Just trust me when I say if someone hits a single to the outfield and it’s not a hard liner to left, Brian Dozier is probably going to just put his head down and go first-to-third. Again, it’s one thing to tag and advance when the ball is hit to the opposite side of the field. Far less often do you see a guy tag and advance to the base which is closest to the outfielder that caught it. Now, to be fair, the ball hit to Desmond Jennings was pretty deep in center and Michael Brantley was moving back when he caught his. But it’s more about the fact that Dozier is able to recognize these things and know his speed well enough to take the extra base. Here we have a couple of ground ball singles to left field in which Dozier scored from second. These are the type of things that, when they happen in the midst of a game, can easily go unnoticed. But when they happen repeatedly over the course of a season, they really add up. 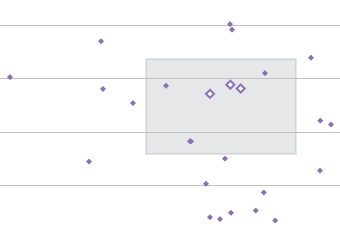 Neither of these are super aggressive displays of baserunning, but they were hit to corner outfielders, who are closer to home plate than the center fielder, and not everyone scores these runs that Brian Dozier scored for the Twins. Here, Manny Machado almost makes an incredible play at third base to prevent a Brian Dozier infield hit. However, “almost incredible” sometimes become troublesome when you have to stretch the limitations of your physical ability to do so. That was the case for Machado on this play, and the ball skips away from the first basemen, though just barely. I don’t know if Dozier didn’t realize how little the ball actually skipped away, or if he just felt like being aggressive. Either way, it worked out and he turned a slow chopper to third into a double. Here, Wade Davis decidedly did not have to stretch the limitations of his physical ability to make this play, yet it still resulted in an error. Again, the ball really didn’t skip that far away. Again, Brian Dozier didn’t care and took the extra base anyway. This one resulted in a run that he scored from second base when the ball barely made it to the pitchers mound. Here we find, again, Brian Dozier scoring from second on a ball that never left the infield. This one happened just last week. Now, I don’t know how much baserunning goes into pre-series scouting reports, but if it does, Asdrubal Cabrera should have known that one of the most aggressive – and successfully aggressive – baserunners in the league was on second base. Either way, Cabrera gave up on the play and turned his back on home plate just long enough for Dozier to manufacture a run with his legs. This one doesn’t say much about Dozier, as pretty much anyone in baseball would have scored from third on that. What’s humorous is Puig, in the first inning of a 0-0 ballgame, bypassing the cutoff man and throwing all the way home, nearly from the warning track, allowing every runner to advance in the process. And that’s it. The first one, Dozier was originally called safe until Don Mattingly successfully overturned the call with a challenge. Either way, it wasn’t the fault of Dozier being overaggressive or really Dozier’s fault at all. Nothing you can really do in that scenario. The second one, Dozier got a little aggressive, but the Twins had just taken a 1-0 lead in the 10th and he was likely running on any ground ball contact. It was a mistake, but it wasn’t an entirely costly mistake given the situation. So there you have it. That’s how a guy like Brian Dozier can be among the most valuable baserunners in the MLB despite not being a premier base-stealer. There is being aggressive, and there is being smart with your aggression. Dozier has been able to take the extra base as often as any player in baseball and only has one real mistake to show for it. Last season, Dozier impressed with his surprising power. This season, the power has continued, but what he has done on the bases may be even more impressive. Every year, at the conclusion of the Major League Baseball season, the MLB hands out awards to many of the games premier players. Every year, these awards are panned by critics and fans alike, usually wondering why their favorite players weren’t chosen. Perhaps the most condemned award, especially by those of us who are more analytically inclined, is the Gold Glove Award. After years of Derek Jeter winning Gold Gloves at shortstop, with some Rafael Palmeiros and Michael Youngs peppered in, the Gold Glove Awards pretty much became a joke among the MLB community. The MLB seemed to catch on to that fact this season and implemented a “sabermetric component” in an attempt to help revitalize the legitimacy of the award. This year’s Gold Glove finalists were recently announced and, to me, there appears to be progress being made. The inclusion of someone like Juan Uribe shows that the MLB is paying attention to the numbers, as Uribe is not someone who would typically pass the “eye test” that people have long based their defensive judgments on, but in reality was a pretty great defender and has been for the entirety of his 13-year career, especially at third base where he played 900 innings for the Dodgers this season. To me, the eye test is a total cop-out, as no fan, let alone manager, can possibly watch every fielding attempt by every fielder throughout the course of a season through completely unbiased lenses as the advanced defensive metrics do. I will admit that the defensive metrics we currently have are far from perfect. But they at least account for every play on the same fair and unbiased scale for each player. With that being said, here are what the finalists and winners of the Gold Glove Awards at each position might look like if voting were based strictly off advanced defensive metrics, free of human bias. So as not to overly complicate things, I used four defensive metrics to evaluate players. First, UZR and DRS made up the majority of the basis for my selections as they are the two most accepted and accurate defensive metrics. Though a little outdated, I still like to use RZR as sort of a tiebreaker for when UZR and DRS are too close to call. Then, just because, I included fielding percentage too. Though errors aren’t a good way to measure a defender’s ability or value, it’s safe to say that if a guy never makes an error of the course of a season he was probably pretty good, and if he made a ton of errors he probably struggled. For catchers, the FanGraphs defense stat was used as a substitute for UZR, and rSB and RPP were used as substitutes for RZR and FP%. Pitchers aren’t included in the study. The MLB included Perez and Wieters, but also had a weird pick in Joe Mauer. Mauer won the Gold Glove at catcher from 2008-2010, despite never being great behind the dish. These likely came as a result of his offensive achievements. Perez gets the nod here for being the best all-around catcher. Wieters, despite being hated by DRS this year for some reason, was still the league’s best pitch-blocker and has a sound reputation for being a good defensive catcher and pitch-framer. Yan Gomes was the snub at his position, having the most valuable arm behind the plate in the American League. This was the weirdest one, on both ends of the spectrum. First, the MLB included Chris Davis – who is average at best in the field – and Eric Hosmer, who one might think would be good based on his athleticism but is actually quite terrible. Then, Mike Napoli came out on top on in the numbers. Napoli, a 31-year old lifetime catcher, played his first full season at first base this year. He also was diagnosed with a degenerative hip condition at the beginning of the year that voided his original contract with the Red Sox, and in reality he would have DH’d for almost any team in the AL that didn’t have David Ortiz. He basically had no reason to be good in the field. Yet, no matter what metrics you look at, Mike Napoli was the best defensive first basemen in the American League, and it really wasn’t close. Pedroia – who already has two Gold Gloves under his belt – and Zobrist were head and shoulders above the rest of American League second basemen this year. Robinson Cano had a great year defensively in 2012 and rightfully won the Gold Glove. This season, it seems he was included by the MLB more for his reputation and offense, as he didn’t grade out much better than average by any defensive metric. Kinsler wasn’t loved by UZR, but he still had the second best DRS and RZR of any qualified second basemen, which is why he edged out Brian Dozier and Cano for my third finalist. This one was easy. It’s no secret that Manny Machado is incredible defensively, as his conversion from already Gold Glove-caliber shortstop to third base went even better than expected. Longoria and Donaldson were second and third, respectively, in each of the remaining categories, making them easy choices. Notably absent is Adrian Beltre, who has been an elite defensive third basemen his whole career and has won four of the last six Gold Gloves. However, at 34 years old, his age may be starting to wear on him as he posted his first negative defensive season since 2007. After the AL third base being the easiest choice, the AL shortstops were the hardest. The two Escobars had almost identical stats, and Yunel has been a better defender over his career, but Alcides had a miniscule edge in UZR and RZR. Florimon was also a sneaky choice to rival the two Escobars, as he led all qualified shortstops in both DRS and RZR. J.J. Hardy was a fine choice by the MLB, as he has been one of the premier defenders at shortstop for nearly a decade, but the defensive talent pool at shortstop is deep, as always, and Hardy just missed the cut this year. Gordon has won the American League left field Gold Glove the last two seasons, and will likely win his third consecutive this season. He had the best ARM rating of any qualified outfielder in the American League with above-average range to go with it. The MLB’s selection of Andy Dirks was panned by some analysts, but I find it to be justified as he had the highest RZR of any left fielder with 500+ innings and was second in UZR. Noticing a trend? This is now the third Kansas City Royal deserving of a Gold Glove and we still have one position to go. A hugely important, mostly unnoticed reason for the Royals success this year was that they were baseball’s best defensive team and it wasn’t even close. Their 79.9 team UZR dwarfed the second-place Diamondbacks (51.1) and third-place Orioles (39.9). Cain was one of the main contributors, playing elite defense at arguably the sport’s most difficult position. Ellsbury and Rasmus had great years as well – and were on the field more – but Cain was the best during his time in center, earning him the nod. This offseason, the Red Sox took part in a current trend in the MLB by throwing away the idea of “corner outfielders” and simply trying to put the best possible athletes – usually natural center fielders – in the three outfield spots. Just a few examples being the Indians with Drew Stubbs (and Michael Brantley to an extent), the Pirates are with Starling Marte and now the Red Sox by signing Victorino to play right field. 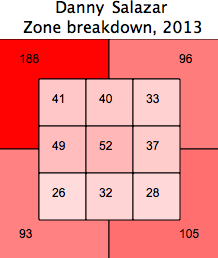 As you can see, it paid off, as Victorino had easily the best defensive season of any American League outfielder. Also, notice who snuck in at the third spot? David Lough, who racked up a full win’s worth of defensive value in just 577 innings for the, you guessed it, Kansas City Royals. I know, blasphemy, right? Yadier Molina has won five consecutive Gold Gloves and will probably make it six this year. He is incredible and one of the greatest defensive catchers of all-time. However, Russell Martin is pretty incredible himself and goes greatly unappreciated for his abilities behind the plate. He has a great catcher arm, in fact the most valuable in the MLB this season, and was the third-best pitch blocker in the MLB. While trying to concoct a way to cheat and give this award to Molina, I considered talking about pitch framing, the impact it has on a pitching staff and how that goes undetected in catcher’s defensive stats while Molina might be the best at it. But then I remembered that Martin is a pretty great pitch-framer, too which contributed a great deal to the success of Pirates pitching this year. Molina is a great catcher, but Martin was better this year and it would be pretty cool if he is rewarded for it. This was only one of two positions with the same three finalists as the three finalists chosen by the MLB. Good job MLB! Yonder Alonso and Brandon Belt are both pretty good with the glove for first basemen, but these three were clearly the best. Something tells me Gonzalez and his three Gold Gloves will end up winning another based on his reputation, but Rizzo was better across the board. Paul Goldschmidt also has a pretty nice showing, proving that he can do just about everything well and is already one of the league’s best players. You can probably figure that Darwin Barney is a pretty great defender because otherwise why would he play every day for a Major League team. Part of that is probably because it’s the Cubs, but it’s mostly because Darwin Barney is a defensive wizard. You could probably say the same thing about DJ LeMahieu, too, though it doesn’t fully explain why Walt Weiss insisted on batting him second. There’s really not much else I can think to write about this one, besides maybe that the Cubs are kind of like the National League Royals in that we’ve had three positions and already three Cubs, except different in that it didn’t help lead them to any kind of success. As I mentioned in the intro to this piece, Juan Uribe even being selected as a Gold Glove finalist shows a step in the right direction for the MLB and an even bigger one if he ends up winning it. By looking at him, you might not assess him as an elite defender on account of his, let’s say “shapely,” frame. However, he had a remarkable year at third base for the Dodgers, adding somewhere in the vicinity of two wins with his defense alone. This should not shock anyone, as he has a career UZR/150 of 19.7 at third base in a sample size of nearly 3,000 innings. In addition, he held his own at shortstop for nine years, logging close to 8,000 innings of above-average defense. Not to be lost in all of this is that Nolan Arendo appears to be exceptional at third base too, with a ridiculous 30 DRS in his rookie season that rivals Manny Machado. Also, hey, look. Another Cub! As I wrote earlier, by playing Starling Marte in left field the Pirates are also taking part in the current trend of disregarding the preconceived notion of corner outfielders and just putting center fielders in the corners. Having two centerfielders in your outfield is very valuable defensively, and Marte is also an above-average hitter, making his role on the Pirates team a very valuable one. The MLB picked Eric Young Jr. over Carl Crawford, which isn’t a terrible selection as Young had the second highest RZR of any left fielder with 400+ innings and also edged Crawford out in DRS, 2-1. However, those two slight edges over Crawford didn’t make up for Crawford’s 8.6 – 3.9 edge in UZR. In addition to Carlos Gomez’s breakout year with the bat, he had an insane year with the glove in center field – one of the main reasons why, along with being one of the game’s elite baserunners, I picked him as my National League runner-up MVP on my Internet Baseball Awards ballot over on Baseball Propsectus. But I’d also really like to talk about that second name there. Some of you may have read Juan Lagares’ name and said, “Who?” My answer to “Who?” would be: “One of my favorite players in baseball after reading Jeff Sullivan’s piece on Lagares and his arm.” Uncovered in that piece, besides who is Juan Lagares, is that Lagares’ arm in center field this season was arguably the most effective arm since we began accumulating advanced fielding data in 2002. Dude has a great arm, but is even better at positioning and taking optimal routes to outfield ground balls by using his experience as an infielder. Lagares shows pretty great range in center, too, and the way he adds value with his arm makes him one of my biggest snubs in the MLB’s selections. Here’s the other position with the same three finalists as the three chosen by the MLB. Good job again MLB! Jason Heyward might have come out on top if he played a full season, but since he didn’t the award is probably Gerardo Parra’s to win. Parra has always been a phenomenal outfielder, but also has always been a part-time player due to his nasty platoon splits at the plate. This year, injuries forced him into the lineup on a nearly everyday basis and he was rewarded with recognition for his abilities in the field. Warning: Very long post ahead. At some point in time, maybe you’ve complained about the lineup your favorite team’s manager used. Maybe you’ve heard of or considered the concept of lineup optimization. Maybe you’ve heard that an optimized lineup, over the course of a full season, wouldn’t make that big of a difference. It really doesn’t, but that doesn’t make it any less interesting. In elementary school I spent precious class time attempting to optimize kickball lineups. I suppose that was my first foray into the world of sabermetrics and general baseball nerdiness. Now, I tend to visit BaseballPress on a daily basis to check the lineups of every team, just because. Even more now, I am writing a long post regarding lineup optimization in the MLB. Following the conclusion of the Major League Baseball regular season, I took to the task of finding each team’s most common starters and lineups, hypothetically optimizing them and comparing the results by which team theoretically cost themselves the most runs by straying from optimization. I sorted each team’s hitters by plate appearances, made sure there was a representative of every position and used Baseball-Reference’s batting order archive to find the most common order those eight/nine players appeared in to find each team’s hypothetical “most common” lineup. Then I plugged that lineup into Baseball Musing’s lineup optimization tool, along with their 2013 OBP and SLG to find the optimized lineup for each team. It’s far from a perfect science, especially with teams like Oakland who often change their lineup by utilizing platoons, but it’s good enough and I wanted an opportunity to tell people much smarter and more qualified than me how to better do their job. Common rpg: 5.448. Optimized rpg: 5.547. Season difference: -16.038 runs. Oh, man. Off to a rocky start. Bear with me, folks, they aren’t all this jarring. This is probably the wackiest one that got spit out. The Red Sox obviously would never hit Dustin Pedroia ninth. The Book likes the nine-hitter to be a high OBP, low SLG guy so the top-of-the-order hitters have guys on base when they come to bat. And to be fair, Dustin Pedroia pretty much had the batting profile of a slap-hitter this season. He had the lowest SLG on the team, and his ISO puts his power production below guys like Brandon Crawford and Chris Denorfia. While his great .372 OBP is likely being put to waste in this lineup, Pedroia’s 2013 numbers fit the bill of an optimal #9 hitter when the rest of the lineup is this good. Common rpg: 4.689. Optimized rpg: 4.779. Season difference: -14.580 runs. I always like Joe Maddon’s lineups. He mixes things up a lot and isn’t afraid to push the envelope. He’s batted catchers high in the order. He’s led off Ben Zobrist, an excellent – but unconventional – leadoff hitter. For a while this year he batted Evan Longoria second, which is quite smart and probably never would have been considered a decade ago. However, Desmond Jennings isn’t an ideal leadoff hitter with a .330 career OBP and Matt Joyce’s .252 BABIP left him with the lowest OBP of his career. Zobrist is the Rays best leadoff hitter and Wil Myers, arguably the Rays most productive hitter, should be higher in the order. Common rpg: 4.724. Optimized rpg: 4.814. Season difference: -14.580 runs. Chris Davis started the season out as the Orioles #5 hitter, because no one yet knew he would transform into some sort of robot humanoid. Once the transformation was well underway, Buck Showalter continued batting Davis fifth and a struggling Nick Markakis third, likely because “if it ain’t broke, don’t fix it,” and the idea that moving a hot batter to a different spot in the order could somehow throw him out of his groove. It took the Orioles until the middle of August to move Davis into the three-hole and by then Davis’ low spot in the order relative to his production likely cost them a handful of runs. Given the disparity of his OBP compared to his teammates, he’s even better suited for the two-hole. Common rpg: 3.978. Optimized rpg: 4.077. Season difference: -16.038 runs. This isn’t the Yankees lineup we’re used to after the last couple months, or really after the last decade. But as Yankees fans well know, it is the lineup we saw for the majority of the season. Sorry you had to see this again, Yankees fans. The Yankees did hit Robinson Cano in his more deserved second-position for a period of time, but it was basically out of necessity as they had no other real hitters to work with. Instead, Ichiro Suzuki spent the majority of the time in the two-hole seemingly on reputation alone, despite being the third-worst candidate for the spot on a team full of Jayson Nix, Eduardo Nunez and Lyle Overbay’s. Common rpg: 4.791. Optimized rpg: 4.914. Season difference: -19.926 runs. Like the Rays and Yankees, the Blue Jays experimented for a bit this season and batted Jose Bautista #2. Like the Rays and Yankees, this was very smart. Like the Rays and Yankees, they inexplicably stopped their experiment and reverted to a more traditional lineup. Melky Cabrera was not a good hitter this year, yet there he sits in the most important spot of our hypothetical lineup, while the Blue Jays have three great #2 candidates in Edwin Encarnacion, Bautista and even Adam Lind, who was basically “slow Jose Bautista” this season. Burying Colby Rasmus‘ .500 SLG in the seven-hole also didn’t help. And, no, that isn’t a typo. J.P. Arencibia really finished with a .227 OBP this year. Common rpg: 5.375. Optimized rpg: 5.510. Season difference: -21.870 runs. OK, this one is actually kind of genius. Although OBP is far more important than speed in regards to a leadoff hitter, speed still kind of matters. You probably don’t want your slowest player batting leadoff, especially if you have a burner in the two or three spot. But the Tigers already have the slowest team in baseball, by far, and Miguel Cabrera is their ideal two-hitter. Since Victor Martinez won’t be holding Miggy up on the basepaths, putting his .355 OBP in front of Miggy is actually really smart, especially considering Miggy hits a first-inning homer like half the time anyway. Austin Jackson’s baserunning ability is better suited towards the bottom of the lineup for singles hitters like Alex Avila, Torii Hunter and Andy Dirks. Because of this wildly unconventional lineup, the Tigers ranked last in the study, and I would really love to see this lineup actually get played out. Common rpg: 4.456. Optimized rpg: 4.509. Season difference: -8.586 runs. As an Indians fan who was constantly frustrated by Terry Francona’s lineups, their rank in the study surprised me. However, the Indians problem was more with player selection, not lineup order, which isn’t reflected in the study. The Indians best statistical hitter, Ryan Raburn, amassed only 277 PA’s and didn’t make the cut. Yan Gomes, the Indians second best hitter, eventually began receiving his well-deserved playing time, but still finished with just 322 PA’s and missed the cut. To start the season, the Indians buried Carlos Santana‘s great OBP in the six-hole and wouldn’t move Asdrubal Cabrera’s putrid OBP out of the top of the order. But Francona fixed his mistake early enough for it not to be reflected in the years end most common lineup. And in that lineup, the Indians did a good job by having their top five hitters be their highest OBP guys. Michael Bourn was not the leadoff hitter the Indians thought they were signing, and was actually a pretty bad one with a .316 OBP. Santana and Jason Kipnis are much more deserving choices to lead off, though in real life I would likely flip-flop them, considering speed. Common rpg: 4.094. Optimized rpg: 4.204. Season difference: -17.820 runs. Despite performing poorly in the study, the Royals two lineups were actually pretty close, and theoretically they could have earned themselves a handful more runs by simply swapping Billy Butler and Alex Gordon’s spots in the lineup. I have always loved Gordon as an unconventional leadoff hitter, but this season he stopped taking walks and getting hits on 35% of his balls in play, leading to a pedestrian .327 OBP after posting marks of .376 and .368 the last two seasons. Butler had a weird year, too, as he started walking all the time and lost all his power, posting a lower isolated slugging percentage than David Lough. But Butler is one of the slowest players in baseball and Eric Hosmer is a pretty good baserunner, especially for a first basemen, so swapping their orders in the optimized lineup might make more sense. Common rpg: 4.301. Optimized rpg: 4.379. Season difference: -12.636 runs. Blame slugging percentage for this one. Joe Mauer should really be the Twins leadoff hitter. But, since slugging percentage is flawed in its attempt to represent power by including singles – something Mauer hits a ton of – Mauer has over 100 points of SLG on Josh Willingham, leading the generator to believe Willingham is a more ideal leadoff hitter despite Mauer’s .404 OBP. We all know that Willingham is more of a power hitter than Mauer, which is why we should always use ISO to measure power, where Willingham edges Mauer .159 to .156 even on a down season. Other than the mistake of batting Brian Dozier leadoff, though, the Twins real-life lineup does a pretty great job, with their OBPs falling in descending order after Dozier. If this lineup generator used ISO instead of SLG like I wish it would, flip-flopping Mauer and Willingham at the top would likely be the optimal order for the Twins. Common rpg: 3.950. Optimized rpg: 4.030. Season difference: -12.960 runs. Alejandro De Aza isn’t a great leadoff hitter with a .323 OBP, but when you have the fourth worst team OBP in baseball, .323 will do. The main problem with the White Sox order is their two-hole, as is the problem with most MLB lineups. Alexei Ramirez’s offensive skill set is basically the exact one that MLB managers are beginning to move away from in the 2-hole, with his .313 OBP, complete disappearance of power and newfound penchant for stealing bases. Contrary to conventional wisdom, good base stealers are better suited for the 6/7 spots in the lineup. Risking outs with your best hitters at the plate, who are more likely to drive you in with extra base hits anyway, is not a good idea. With that aside, the White Sox did well by choosing the correct leadoff hitter and keeping their worst hitters at the bottom of the order. Common rpg: 4.933. Optimized rpg: 4.989. Season difference: -9.072 runs. Surprise! The Oakland Athletics scored well in a SABR-slanted study. And this doesn’t even take into account how well the A’s optimize their lineup on a daily basis by correctly utilizing platoons. But either way, in this theoretical lineup, the A’s do a good job by getting their second and fourth hitters correct. Though breakout player and MVP-candidate Josh Donaldson is better suited to lead off, Coco Crisp was still a good option. And whether incidental or not, Yoenis Cespedes‘ low OBP in the three-hole doesn’t hurt them too much, as OBP isn’t as important in the three-hole as conventional wisdom would tell you. The A’s do well in this study with the lineup provided for them, and do even better in real life by putting the right guys on the field every day. Common rpg: 4.481. Optimized rpg: 4.582. Season difference: -16.362 runs. Ian Kinsler is another guy who doesn’t scream “prototypical leadoff hitter,” basically in the sense that he’s not a speed-first centerfielder, but he is a pretty great one and easily the Rangers best option. So you have to give them credit for sticking with him instead of going to the more conventional, “easy” choice of Elvis Andrus or Leonys Martin. However, the Rangers lose a lot of value by keeping the speedy Andrus in the two-hole, a spot he really wasn’t suited for this season with a career-worst .327 OBP. Adrian Beltre is the perfect fit for the Rangers #2 hitter, and Andrus is better suited for the bottom of the order. With Andrus’ basestealing abilities, I think it would be wiser to switch his spot with Jurickson Profar’s in this optimized lineup, giving Andrus the opportunity to attempt steals with the 8th and 9th hitters up, rather than the 1st and 2nd. Common rpg: 4.864. Optimized rpg: 4.945. Season difference: -13.122 runs. This one is similar to Detroit’s, but unlike Detroit’s, this one probably only works in theory. When Miggy is batting second and the entire team is slower than molasses in an igloo, I think you can get by with a slow-running, high-OBP guy like Victor Martinez leading off. When your #2 hitter is Mike Trout, you’re probably costing yourself extra bases on would-be Trout doubles and triples by having Chris Iannetta on first in front of him, likely having just drawn a leadoff walk. If Iannetta weren’t so slow and Trout weren’t so fast, Iannetta would actually be a pretty great leadoff hitter. Of all players with 350+ PA this season, only Joey Votto posted a higher BB% (18.6) than Iannetta (17.0). The Angels did do the right thing by putting Trout where he belongs in the two-hole, though. A .432 OBP is great for leadoff, but when you hit for more power than Giancarlo Stanton and Adam Dunn, some of those extra base hits go to waste leading off. Common rpg: 4.382. Optimized rpg: 4.439. Season difference: -9.234 runs. The Mariners began the season with Dustin Ackley at second base and Brendan Ryan at shortstop. By the beginning of June, Ackley had hit himself back to AAA and not much later, the Mariners cut ties with Ryan’s offensive deficiencies in favor of rookies Brad Miller and Nick Franklin. Both held their own with the bat from the get-go, earning themselves the top two spots in the Mariners everyday lineup. However, despite holding their own, neither are really top of the order hitters with sub-.320 OBPs and just average power. Better suited for the top spots are the Mariners best player, Kyle Seager and most productive hitter, Kendrys Morales. Still, the Mariners performed well in the study, likely due to the similar profiles of most of their hitters. Common rpg: 4.133. Optimized rpg: 4.176. Season difference: -6.966 runs. Coming soon: Part 2, with National League lineups and conclusion.